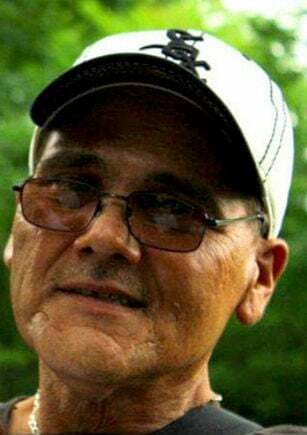 EUREKA – John Frank Galindo Sr., 59, died Sunday, April 7, 2019, at his home in Eureka. He was born June 4, 1959, in Chicago, the son of Miguel Angel Galindo and Rosario Rodella. Survivors include his fiancée, Tammy Labombard, Eureka; one daughter: Audreyrose (Zachery Rodriguez) Galindo, Eureka; two sons, John Galindo Jr., Eureka and Anthony Galindo, Evansville, Ind. ; one grandson, Joseph Elven Jr., and one brother, Marcelino (Deana) Ortega, Chicago. He was preceded in death by his mother, one sister, Rosario Galindo, and two brothers, Anthony Galindo and Angel Galindo. John worked as a carpenter and also enjoyed woodworking. He was known as a jack of all trades with his favorite tool being duct tape. John was of the Catholic Faith. He will be remembered as a loving father, grandfather, friend and jokester. Cremation rites have been accorded. Argo-Ruestman-Harris Funeral Home, Eureka, is in charge of the arrangements.